The long-anticipated SHIFT festival of American orchestras is taking place this week in Washington, D.C., celebrating the vitality, identity, and extraordinary artistry of orchestras and chamber orchestras. Washington Performing Arts and the John F. Kennedy Center for the Performing Arts are hosting the Atlanta Symphony Orchestra, Boulder Philharmonic, The Knights, and the North Carolina Symphony in an immersive festival experience including full-orchestra performances in the Kennedy Center Concert Hall and community events throughout the city. The festival also included a symposium that featured League President and CEO Jesse Rosen at the Library of Congress. 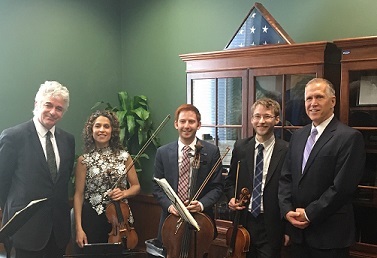 The participating orchestras have been warmly welcomed by members of Congress throughout the week, including Sen. Kirsten Gillibrand (D-NY), Rep. Hank Johnson (D-GA), Rep. Jared Polis (D-CO), Rep. David Price (D-NC), and Sen. Thom Tillis (R-NC). Several musicians have also been meeting -- and sometimes performing for -- their members of Congress, sharing their experiences as musicians, and describing the importance of the policies that their elected officials contemplate in D.C.
On March 24, House Ways and Means Chairman Kevin Brady (R-TX) was quoted as saying, "We want to move forward this spring in the House and to be ready to deliver tax reform in 2017." Orchestras have joined the broader nonprofit sector in asking Congress to ensure that comprehensive tax reform will expand incentives for charitable giving and support nonprofit services to communities. On March 17, Ways and Means Committee Members Reps. Pat Tiberi (R-OH) and John Lewis (D-GA) introduced House Concurrent Resolution 34, celebrating the 100th anniversary of the charitable deduction that was enacted into the federal tax code in 1917. The resolution reinforces that "individual contributions benefit the arts, humanities, religious institutions, education, human services, the environment, health programs, and many other sectors" and that "philanthropy serves as a dynamic force to direct private resources toward addressing the difficult issues and evolving needs of society over a period of time, beyond a single act of good will." As Congress continues to work on the details of a tax reform proposal, check out our tips for how to take action. The League and a growing number of national arts organizations have signed an arts statement in response to the President's March immigration executive order. The statement urges policy leaders to retain access to artist visas and support opportunities for worldwide cultural exchange during ongoing consideration of new immigration policies. The White House has revoked its initial executive order that was announced in late January and issued a new executive order that would have the effect of imposing new limits on travel to the United States, beginning on March 16, for certain foreign nationals from Sudan, Syria, Iran, Libya, Somalia, and Yemen. As judicial action in response to the order continues, and as the Administration considers next steps, you can find up-to-date information on Artists from Abroad, a website that the League manages and which provides guidance for engaging foreign guest artists for performances in the U.S.